To produce epoxy polymers, epoxy resins are mixed with a hardener, producing an inert thermoset material. The finished, hardened epoxy does not pose any health risk and offers superior performance, including excellent adhesion and mechanical properties, as well as corrosion and chemical resistance. 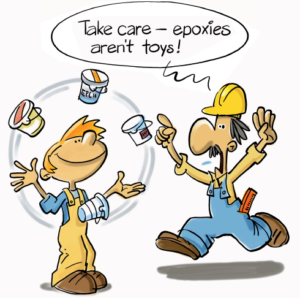 Epoxies are widely used in numerous applications. They need to be handled in a professional manner following established safety procedures. The components of epoxy systems may have hazardous properties and can become dangerous in contact with human skin. However, they are perfectly safe to handle, provided that basic precautions are taken. The European Epoxy Resins Committee (ERC) has developed a series of documents to assist and inform epoxy users. These guidelines describe situations where there is a risk of contact with an epoxy system and offers clear advice for the safe handling of these products. This information is especially designed to support craftsmen, business managers, safety and education managers in the selection and provision of suitable organisational, technical and personal safety tools and procedures. But they cannot replace the specific safety instructions given for each product, which must always be respected in its entirety. The common goal is to prevent incidents or health problems and support the continued safe use of epoxy systems in all applications.